Though Belle Starr may of been an outlaw, and not the exact role model one may be looking towards for moral aspects, she believed in herself. She had the role of a woman who grasped strength, independence, responsibility, determination, etc. Belle Starr showed women to today that we can get what we want if we use our words, persuasion, and education as our weapons instead of rifles. One may not look up to her because she broke the law and failed to be a womanly idol, but that's why one should look up to her! 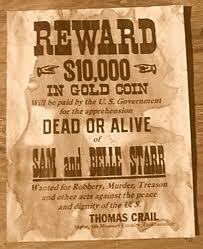 Belle Starr was brave enough to try something different, to create a different area of occupation for a woman's world.